An Armenian opposition leader who claims to have been robbed of a victory in last week’s presidential election has rejected the congratulations of Western leaders addressed to President Serzh Sargsyan, whose reelection was formally certified by the Central Election Commission on Monday. Raffi Hovannisian, who is making another tour of provinces today as part of his nationwide campaign to make Sargsyan “admit the people’s victory”, has reacted to the news of congratulatory messages to the current president from U.S. Secretary of State John Kerry, President of the European Commission Jose Manuel Barroso and other western leaders by reiterating his position that such statements are irrelevant if the people of Armenia do not accept the result of the election in the first place. 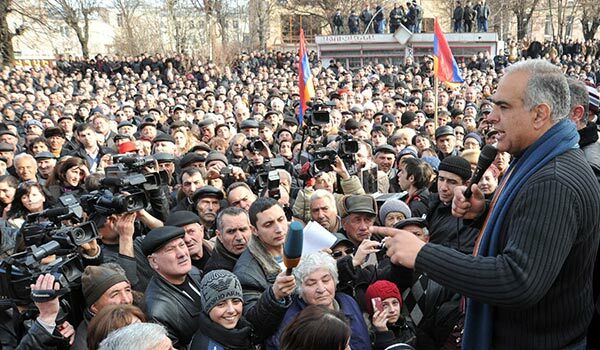 Speaking to a group of supporters in the town of Armavir the opposition leader went further to claim that such congratulations primarily meet the interests of the foreign states that he said want to see Armenian concessions on some geopolitical matters, including the Nagorno-Karabakh issue. In a message addressed to Sargsyan yesterday U.S. Secretary of State Kerry, in particular, stressed that Washington is not satisfied with the current status quo in Nagorno-Karabakh. “We must seize this moment to pursue meaningful progress in the peace process,” said the U.S. official.